Hi Everyone! With 2016 ALMOST coming to an end, I'm hurriedly trying to get through my overdue ARC titles, so that I can have a fresh start for 2017. Basically, expect a lot more ARC Reviews by the time this month closes. I have with me today two titles, one historical contemporary novel, Poppy, which is set in 1914 during the first World War and the second, The Girl In The Picture is a murder mystery novel! Blurb Description: England, 1914. Poppy is fifteen, beautiful and clever, but society has already carved out her destiny. There's no question of her attending the grammar school - it's too expensive and unsuitable for a girl. Instead, Poppy will become a servant at the big house. And she'll 'keep out of trouble'. But Poppy's life is about to be thrown dramatically off course. The first reason is love - with someone forbidden, who could never, ever marry a girl like her. The second reason is war. Nothing could have prepared her for that. As she experiences what people are capable of - the best of humanity and the very worst - Poppy will find an unexpected freedom and discover how to be truly her own person. Truth be told, I've been putting off reading this book for a while now due to no fault of its own. For a really long while, it just wasn't the book I wanted to read at the moment because it seemed slow and deep. Today, it's the second book I finish as I wait out a cyclone, and I can't believe I waited so long! Poppy, the first book in a series, centres around the life of a parlourmaid in a rich British house who becomes one of the 70,000 VADs (Voluntary Aid Deployments) in the First World War. This book covers the beginning of the war in 1914 up until the end of 1915 and covers the world perfectly. From patriotic and anti-German sentiments, the aristocracy and the working class, the mannerisms, social conduct, technology and language in the early 20th Century, Mary Hooper constructs a world so powerful you will believe you're in an episode of Downton Abbey. There were a lot of things I loved about Poppy, but truth be told, she seemed TOO good to be true, a generous, giving trusting girl with not even a single mean bone in her body. Do those even exist today? I did like her, a lot, but I kept waiting for the other shoe to drop, for her to seem more human, but nothing did. I guess I liked her, but I just didn't believe her. 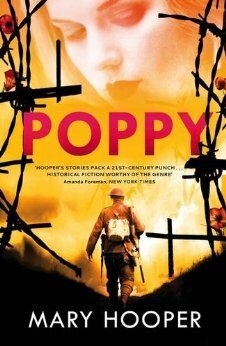 While Poppy herself could have been a slightly flawed character, one thing I ABSOLUTELY LOVED was the sentiment of people in the war, the everyday gruesomeness and the PURE EMOTION, that someone reading about in a History Textbook could never comprehend, making me look at the world wars in a completely different light. All in all, a book I'm sad I took so long to get to. 4 stars. Blurb Description: Nicole Morgan has been labeled many things — the geeky music girl, the shy sidekick to Miss Popularity, and the girl with the scar. Now only one name haunts her through the halls of Oyster Bay Prep. 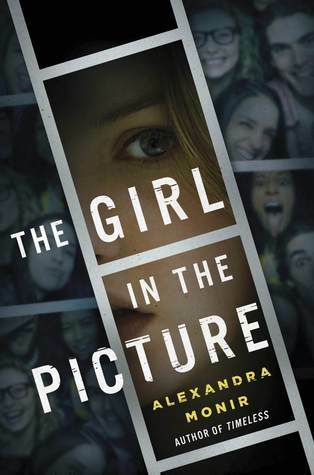 After high school heartthrob Chace Porter is found dead in the woods near the school, the police are in search of the girl whose picture with Chace is the only clue found amongst his personal belongings. A girl who no one knew was even close to Chace–and whose dormmate, Lana Rivera, was Chace's girlfriend. Nicole is that girl and now she's the primary suspect in his murder. From Alexandra Monir, author of the popular time-travel novel Timeless, comes a gripping mystery and a poignant romance in one thrilling read. While YA Murder Mysteries aren’t my FAVOURITE genre (I’m a fantasy girl all the way) there are a few of them that catch my intrigue, and The Girl In The Picture was certainly one of them! And all these elements were functioning together REALLY WELL, until, suddenly, there was the victim’s SPIRIT involved. For me to take a murder mystery seriously, it needs to be all real elements, but Chace Porter’s Spirit guiding the two girls in his (past) life in an attempt to find his killer was STRANGE. It ruined this good murder mystery, turning it into a murder- paranormal genre. And it just… Didn’t fit. While the presence of a spirit certainly made things less believable, there still were a lot of things I DID like about the book, including the format it was written in. The book switches from one of the girls, Nicole Morgan, a violin prodigy, in the present on the very day that Chace’s body is discovered to Lana Riveria, a Congresswoman’s daughter in the past as she begins her romantic involvement with Chace and her friendship with Nicole. Both girls had strong, unique voices, their personalities and fears well heard from their view points. While I didn’t like Chace too much, the girls were a good make-up for him. All in all, The Girl In The Picture is a book DEFINITELY worth a read, but just be prepared for the Spirit of the Dead Guy! 3 stars. What is your favourite book set in World War 1? Have you watched any TV Shows set in that era? What are your favourite YA Murder Mysteries or Adult Murder Mysteries?